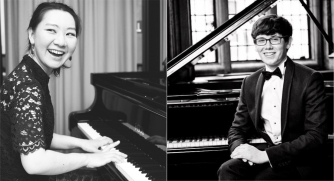 Dina Duisen returns to 1901 Arts Club with piano colleague Martin James Bartlett to present a programme of 4-hand piano music. Tickets include a complimentary post-concert drink. Kazakh-British pianist Dina Duisen was born into a family of musicians in Almaty, both her brothers are violinists. She studied in Kazakhstan and USA before completing a Master of Arts Degree in Performance at the Royal Academy of Music and graduating with distinction in 2011. She is a major prize-winner at many piano competitions, including the 29th International Piano Competition in Senigallia, Italy, the Shabyt International Competition, the National Competition of Kazakhstan and the International Musician of the 21st Century Competition. Dina has also participated in a number of international music festivals in Europe, the USA and Asia, including IMS Prussia Cove Masterclasses and Open Chamber Music, Rome Music Festival and the Oxford International Piano Festival. Twice Dina was one of eight pianists selected to participate in Sergei Babayan’s International Piano Academy at the Cleveland Institute of Music. She plays with violinist Alessandro Ruisi and collaborates with The Ruisi Quartet and principal clarinettists Franklin Cohen (Cleveland Orchestra) and Chris Richards (LSO). Dina gave the Asian premiere of Mazurkas by British composer, Thomas Adès. She has been the resident class pianist for violin and viola classes at IMS Prussia Cove and Casalmaggiore International Music Festival. Last year Dina joined Sinfonia Cymru for Twisted Rhythms: Mark-Anthony Turnage Birthday Concert at the Vibrate Festival. Dina was invited to join the Mercury Quartet for a concert at George Enescu Festival. In 2018 Dina will debut at the Royal Concert Hall in Nottingham, Cadogan Hall in London, also appearing at the 20th Anniversary Concert of the Oxford Piano Festival. Dina has released her solo debut album Mazurkas from Chopin to Adès which was recorded at Kings Place with the Grammy-award winning producer Andrew Keener. Martin James Bartlett has performed in recital and with orchestras at the Royal Albert Hall, Queen Elizabeth Hall, Barbican, Wigmore Hall, Purcell Rooms, Birmingham Symphony Hall and Cheltenham Town Hall. He has also performed internationally across France, Italy, Germany, Serbia, Russia and the USA. Winner of BBC Young Musician of the Year 2014, Bartlett’s performance of Rachmaninov’s Rhapsody on a Theme of Paganini, with conductor Kirill Karabits and the BBC Scottish Symphony Orchestra, received overwhelming acclaim from Edinburgh’s Usher Hall audience and from those tuning into the live recording broadcast on BBC4 and BBC Radio 3. He made his BBC Proms debut in 2015 performing Gershwin’s Rhapsody in Blue with the Royal Philharmonic Orchestra, conducted by Eric Whitacre. He is a Foundation Scholar at the Royal College of Music. In 2016, he performed at Her Majesty, The Queen’s 90th Birthday thanksgiving service, which was broadcast live on BBC One from St. Paul’s Cathedral. Most recently, Bartlett made his Japanese debut performing Prokofiev Piano Concerto No.3 with the Tokyo Symphony Orchestra, and performed Mozart’s Piano Concerto in C minor, under the baton of Sir Bernard Haitink.